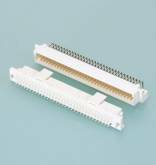 Originally developed for TV applications, this 2.54mm pitch DIN conforming board-to-board connector, has now been added to JST's general connector range. 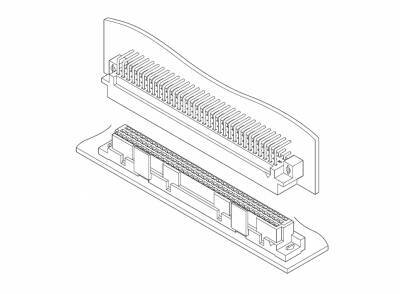 With options of both 64 and 96 circuit available and designed to operate within a temperature range of; -25oC to + 85oC (including temperature rise when applying electrical current), this connector is suitable for most electrical applications. Available in through hole (THT) and utilising a secure PCB locking feature, this connector is a very simple and efficient product to mount to the PCB. It also incorporates two types of locking mechanism, a 'friction lock' for general electrical applications and a 'secure lock' for more testing high vibration environments. This mechanism securely holds housings and improves resistance to vibration and shock of PC board. The friction lock connector is also available. The DIN connector has hook pins that allow it to be temporarily mounted on the PC board. This prevents connector from lifting or changing position while it is being mounted.